I was searching online one day when I happened across an intriguing documentary titled Children of Alcatraz. 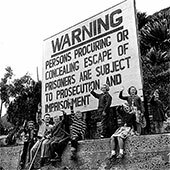 The compilation of interviews featured people who had grown up on Alcatraz Island as children of the prison staff, some even claiming to have secretly befriended notorious inmates despite rules to prevent any contact. By the end of the video, I knew I had a story to tell, one of a hardened prisoner whose acquaintance with the young daughter of a guard would lead to irreversible consequences. When I researched Alcatraz further, I was just as surprised to learn about an inmate named Elliot Michener. As an entrusted passman, he had been assigned to work in the warden's mansion, where he later built and tended a greenhouse, and was even granted special permission to work outdoors seven days a week under limited supervision. The paradoxical setting fascinated me: one of a colorful, peaceful haven meant for nurturing and growth, set next to a bleak concrete prison where lives often withered. During a night tour on Alcatraz, surrounded by the steel bars and cold gray walls of a cell, I gained a sense of appreciation for the respite found in that greenhouse. And when I boarded the boat to leave, I took with me a notepad full of astounding facts about the infamous prison, the inmates who once lived there, and escape attempts that often ended in tragedy. "Kristina McMorris evokes such a strong sense of place that to open her books feels less like reading and more like traveling. Her absorbing new novel...[is] a transporting piece of historical fiction." "The story will grab your heart on page one and won't let go until the end—and if you're like me, not even then. I absolutely love this book, and so will you." "The story makes for compulsive reading as it jumps between Shan's youth and young adulthood, touching on such diverse underworlds as the Black Hand mafia... and the vaudeville life. An intricate and intriguing entry into the American immigrant canon." "Richly woven and absorbing... [a] compelling tale of survival and second chances, and of one immigrant's fantastic journey in the first decades of the 20th century." "An absorbing tale of deceit and self-deception, survival and second chances, the ties that bind and the lure of the unknown." "Beautifully written with mesmerizing details, this is one of those books that sticks with a reader... extensively researched and the historical images are incredibly accurate... an absolute must-have." "In terms of both the character and the era, McMorris took a chance, and she succeeded. And the careful plotting—another McMorris hallmark—pays off in an absorbing story." "A beautifully told story...with an exhilarating ending that I couldn't put down and stayed up well past my bedtime to finish." "McMorris' gripping immigrant saga...is a young man's battle with hardship and tragedy, but it is also a portrait of America during a turbulent time and a quest that ends in triumph. Readers will be caught up in this well-told story." 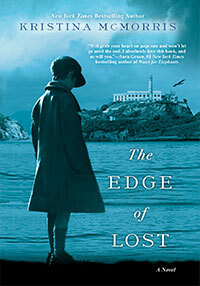 "For readers interested in both the historical significance of places like Alcatraz and New York in the early 20th century and the suspense of a well-written mystery, The Edge of Lost is a novel that does a fine job of illustrating its settings alongside an enthusiastic protagonist." "In The Edge of Lost Kristina McMorris takes us on a thrilling ride...This book is a wonderful read!" "McMorris manages to pack this book with all the messiness and nuances of a life. Her vivid descriptions and use of language make you feel like the 'fly on the wall...I heartily recommend embarking on this journey." "McMorris evokes each setting with dazzling period detail, right up to a tense, edge-of-your-seat ending that left me breathless." "A thoroughly mesmerizing novel. I adore everything that Kristina McMorris writes and this book is no exception."